Here’s my version of “Android, Where’s My Car?” It includes the addition of nearby restaurants and eateries that you can go to after the game is over. It turns out that commas are important in more than just language. They are apparently important in building mobile apps as well as I discovered while building this week’s app for EDTECH 597, “Android, Where’s my Car?”. While there were a few things that I misread on the blocks, causing my app to sort of function, but not the way it was supposed to, the final thing came down to making the maps work. The offending issue was a comma between the two coordinates. I bought the class book on Kindle for the desktop, thinking that it would be more convenient since I’m already on the computer anyway, and since one of my fascinations with the mobile apps class in the first place is how books are changing and how mobile apps will affect that. It turns out that the writing is very small, so what I mistook for two text block placeholders were in fact, commas. Being a very visual person, the written instructions don’t often make sense to me until I’ve walked through the steps a couple of times using the blocks. It took me hours to finally put two and two together. In hindsight, an app that should have maybe taken five hours tops, took me between 10 and 12 hours. Ugh! 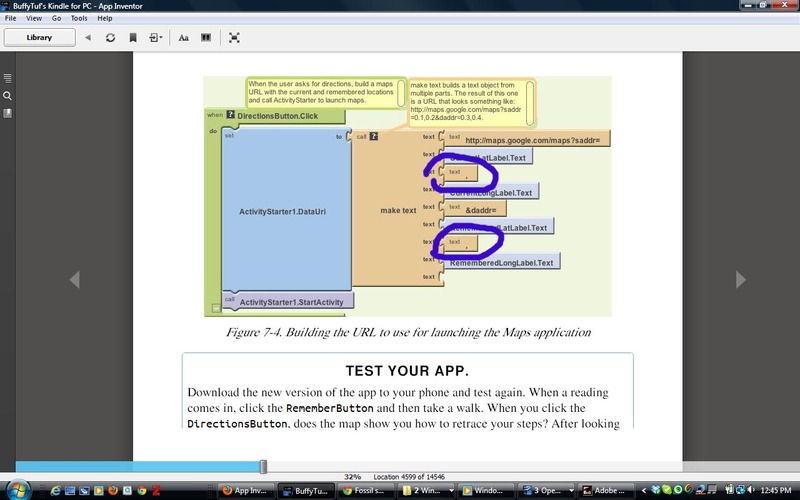 The section of the App Inventor blocks giving me trouble. The tiny commas are circled. Oops! But some good things happened as well. I got to explore a theme that I learned about a long time ago when the web and websites were really starting to come on with a vengeance. I met this woman who wanted to create a Boise-themed website. One of the ideas she had was a theme page that would make recommendations for where people could eat after the BSU game. I thought that this was a clever idea, and for about the last 15 years, that idea has come back to me off and on. Now that I’m in this class, it occurs to me that this theme in many ways is better suited for mobile apps because of the, well, mobile aspect of the device. My thinking is that if you’re already at the game and you decide to wait things out until the traffic dies down before you even think about moving your car, then having the information at home on your computer won’t do you much good. True enough, it’s information that people can write down, but having an app for this purpose makes a lot of sense. You just click on the app and a list of restaurants and coffee shops near BSU along with maps and some information about them are at your fingertips. 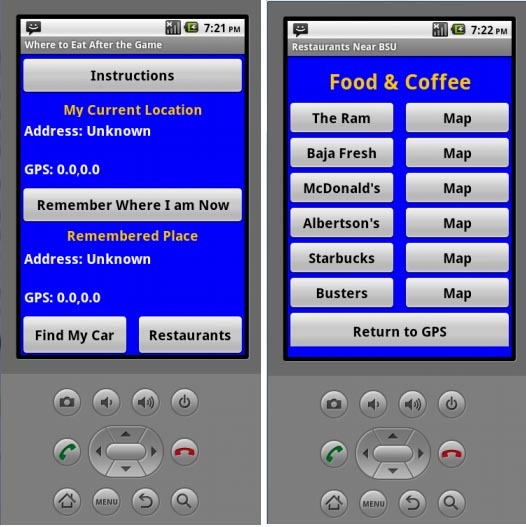 This type of app goes hand-in-hand thematically with the GPS aspect of this week’s app as well, because if you do walk to say The Ram in Boise from the BSU parking lot, you can set the GPS for your car, walk to the restaurant, and then find your car on your return. As I’ve mentioned many times in these blog entries, I want to know the most logical way to develop an app guided by the question, “What is the most logical end to the development of this app?” In other words, where are the circumstances surrounding its creation taking me. I really saw this for the first time last week, and now this week’s app is pointing me in that direction as well. The addition of the restaurants and eateries around BSU logically extended the app’s reach well beyond—but not illogically—past the original parameters of the assignment. Besides the visual design aspect of the class, this has to be my favorite part of being in EDTECH 597. On a related note, it looks like mobile apps are helping people on the East Coast deal with the incoming storms. There was an article in CNN this week about tracking Hurricane Isaac. If anyone needed up-to-date information and GPS capabilities, the folks in the paths of these storms would certainly be candidates. While it’s not certain yet how the storms will affect satellites having mobile capabilities to reach the web at least for a while must be very helpful. These are quite logically storm-tracking devices. Finally, because of the difficulties that I had in developing the app this week, I didn’t have as much time to work on the visual design aspect. I did some. I included the blue and orange for BSU and created a clean interface, but it’s still rather dull-looking. I would change that aspect in the future. Tagged 597, Android, blue and orange, BSU, EDTECH 597, GPS, Hurricane Isaac, mobile apps, storm tracker, The Ram in Boise, where to eat after the game, Where's My Car? 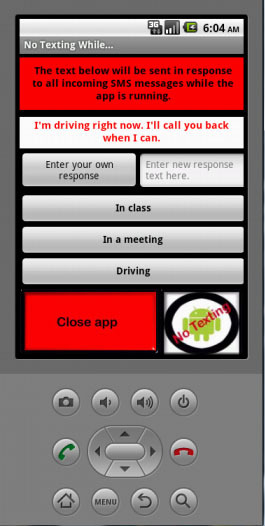 The user interface for my “No Texting While Driving App” for EDTECH 597. I have said in my in-class forum posts for the EDTECH 597 mobile app design class that design must be more than just making something look pretty. It must also solve problems. However, I also know from my experience working in the newspaper business that good-looking design is important if for no other reason than to make people pick up and buy your newspaper or magazine. It is with this mindset that I approach the app class. What I have noticed is that very often my designs are heavy on pretty and not always so much on function. They’re not bad. They do work, but I just feel like I’m not yet emphasizing the UX UI (user experience, user interface) aspect of the designs as well as I want to—mostly because I don’t have a lot of experience in seeing how this is done—either from other apps or from design in general. There are a lot of great apps out there, but having not had a cell phone for several years has put me behind as a mobile app consumer. The road and its supports already existed. It provided a partial framework for a project onto which the designers could add. Together, the viaduct structure and the wind turbines looked beautiful, so the design for this was able to meet my design criteria of the end product being both beautiful and able to solve problems at the same time. It had the added benefit of bringing two useful, but unrelated structures together in one structure. These are items that you wouldn’t necessarily automatically think would go together, but once they were put together, it was an “Of course!” moment. As in the case of the viaduct, the usefulness of this week’s app design is already built-in, the beauty of the design is not. As I already mentioned in my design for the drawing app, I wanted to provide visual clues that tell the user what to look at even if they don’t have instructions to read. In the book, The Design of Everyday Things by Donald Norman, these types of visual clues are called ‘affordances.’ They are the visual clues that allow a person to know that a push-plate on a door means to push the door open instead of pulling it, that a knob means to turn and open, and a slot provides a place to insert something. It makes me wonder what—if any—affordances did the designers for the viaduct project see or maybe more accurately, see lacking and how did they land upon the design they did given the minimal parameters set forth by the beams of the viaduct? So the question for me as I work on building this app beyond the basic prototype provided for us in the book is “What kind of visual affordances can I use to make this app more UX UI-friendly and still beautiful at the same time?” And more importantly, like the designers of the windmills, how can I use the structure of the design given to us in the book as the “No Texting While Driving” example and build on it so that it’s both beautiful and useful? EDTECH 597: Developing a Chocolate App Thats Good Enough to Eat! EDTECH 597: Mixing Chocolate Chip Cookies and Mobile Apps! Yum!